Happy Mother’s Day to all of the moms out there! We baked up something extra special for you! Pass this recipe on to your children to bake for you for a sweet breakfast or save them for dessert after dinner tonight. Enjoy! Preheat the oven to 400F. Line a 12 cup muffin pan with cupcake liners. Set aside. Sift the flour, sugar and cinnamon together in a bowl. Whisk together. Add the cold coconut oil and mix with a fork until the mixture looks like coarse wet sand. Set aside. Beat the cream cheese, egg, sugar and vanilla in a bowl until smooth. Sift the flour, baking powder and salt in one bowl. Whisk together. In another bowl, beat the milk, egg and sugar. Stir the dry ingredients into the milk mixture gently. Mix in liquid coconut oil. Do not overmix. The muffin batter will be slightly lumpy. 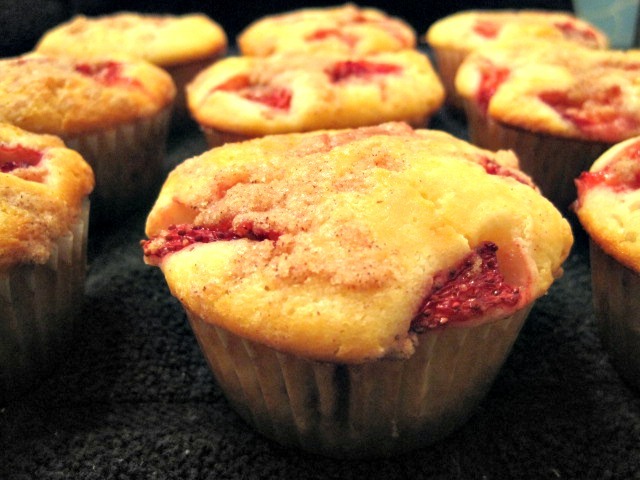 Scoop a tablespoon of the muffin batter into each cupcake liner. Sprinkle a few pieces of strawberries. Add a dollop (about a heaping teaspoon) of the cream cheese filling. 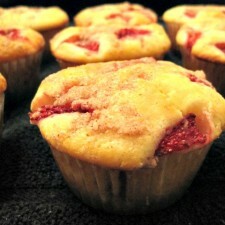 Sprinkle a little of the cinnamon streusel on top of the filling, followed by another layer of the muffin batter. Add a few more pieces of strawberries. Lastly, sprinkle the cinnamon streusel on top. Bake for 25 minutes or until a toothpick inserted in the middle comes out clean. Cool in the pan for 5 minutes. Remove and transfer to a wire rack to cool completely. This would be awesome everyday, not just for Mother’s day ;p I don’t have a Kelapo coconut oil though (just heard of this brand now), would this do http://products.mercola.com/coconut-oil/ ? I’ve been using it for about a year now and so far it’s okay. How does Kelapo compare to that? Kelapo coconut oil is certified organic and fair trade certified. It is extra-virgin coconut oil meaning it is not processed, bleached, or chemically treated. It is cold pressed. Keep an eye out by following us on Facebook at facebook.com/kelapococonut for more great sample promotions or coupon codes so you can try it for yourself. You will see the difference! Also, visit our website at Kelapo.com to learn about our sustainable farming. How long should these be baked at 400°? The directions stop at filling the muffin tin. Thanks! Sorry about that Karen. Just updated the recipe. Enjoy!